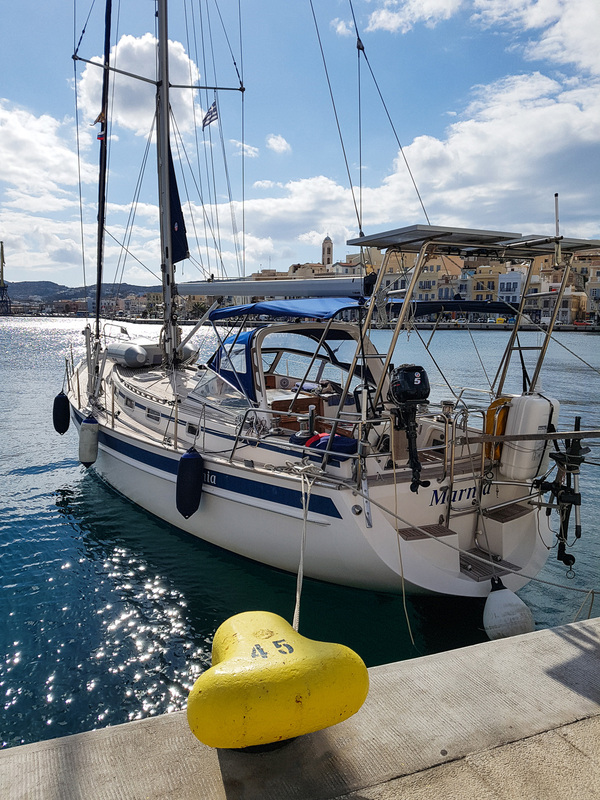 After a very long absence, I returned to the Greek islands and specifically to Syros, in the heart of Cyclades—a group of islands three hours from Athens, mostly known for the Cycladic civilization and the cosmopolitan islands of Santorini and Mykonos. 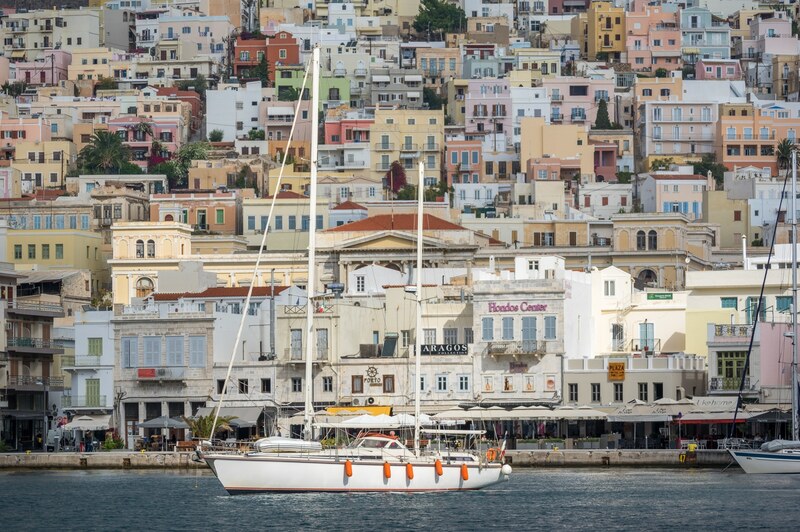 Like every island in the Aegean Sea, Syros has a defining characteristic—its Latin influence. As the ship begun turning to starboard, Ermoupoli and its hospitable port filled the horizon. 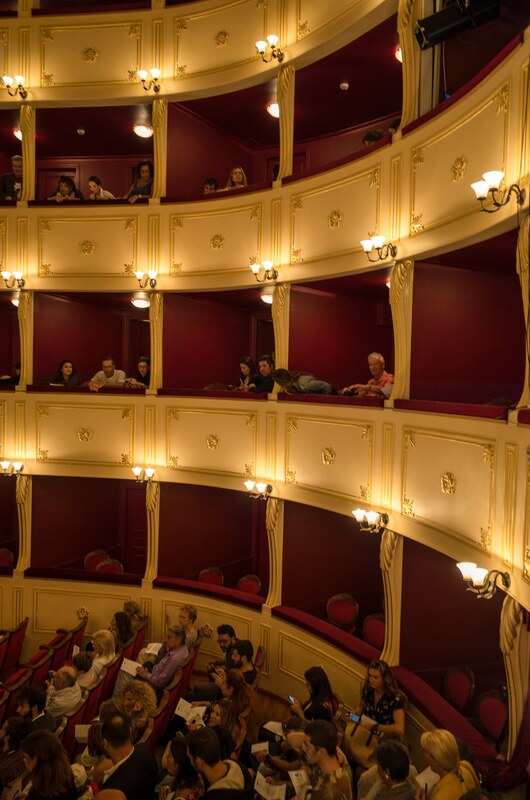 The capital of Syros is built amphitheatrically on a series of hills. 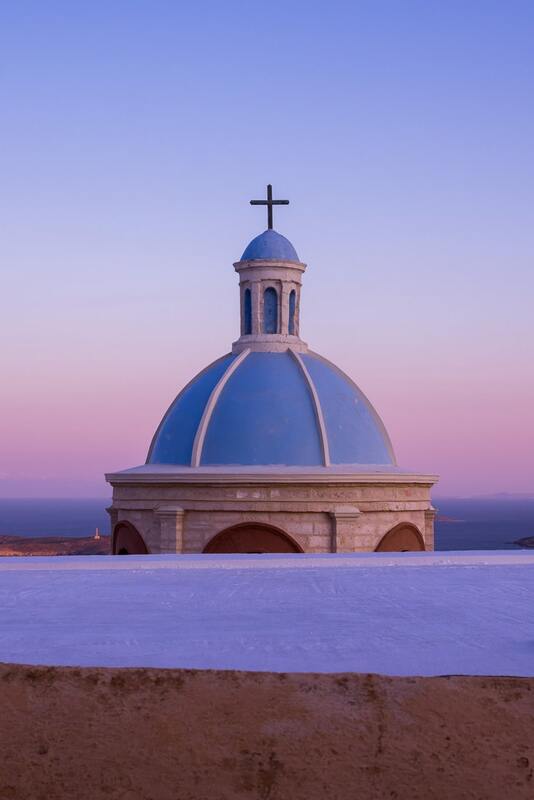 Two big churches on the two highest hilltops reveal the island’s modern history in a single gaze. The catholic St. George on the left and the orthodox church of the Resurrection to the right. Almost fifty percent of the island’s population are Catholics. 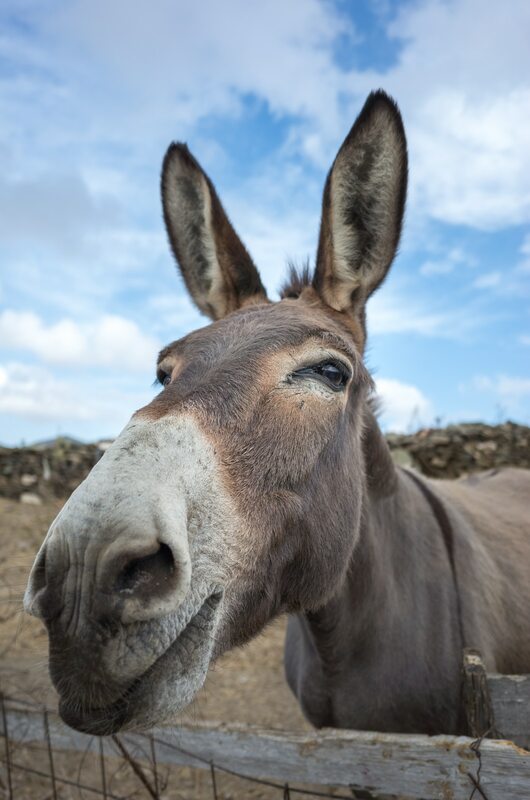 A unique feature you won’t come across anywhere else in Greece. 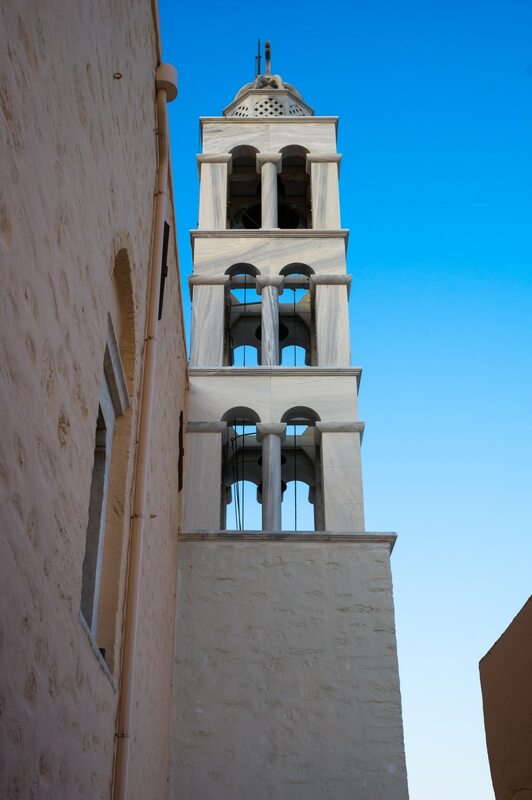 Many other places were influenced by the Venetians and the Franks but none as much as Syros where till this day you can see and experience this influence not only on architecture but the people as well. When the Venetians occupied the island after the fall of Constantinople by the crusaders in 1204, the locals kept the Greek language but most of them converted into Catholics. Because of that, the island had its own small renaissance and continued to flourish even after its occupation by the fierce Hayreddin Barbarossa in 1537, since the islanders managed to retain their privileges under the Ottoman Empire as well. The ship docked in a swift three sixty manoeuver and immediately a wave of people and vehicles got out from the rear ramp, while another one was waiting to get in. The whole thing took less than ten minutes and the ship left immediately for the next island, the famous or rather “infamous” Mykonos. It didn’t take me long to walk along the main road through the café and restaurant tables that were laid across the promenade all the way to my hotel which was right on the seafront at the east pier—known as Nisaki. It was a beautiful autumn day. Warm and sunny with small clouds running across the blue Greek sky and the Aegean was calm and as blue as a sea can be. I checked in just to drop my luggage and left immediately to meet some friends for coffee at the Market district which is just behind the harbor. Its small alleys are paved with white stone and only the little shops brake this white monotony with their colored doors and windows. 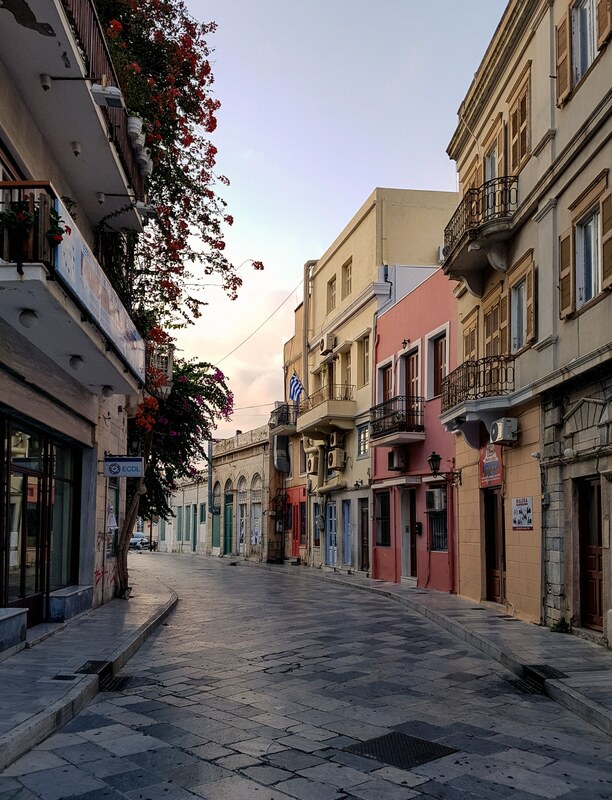 I was walking on the quiet afternoon streets observing the small balconies perched left and right, admiring the numerous pink bougainvilleas which are everywhere and seem to be the locals’ favorite flower. 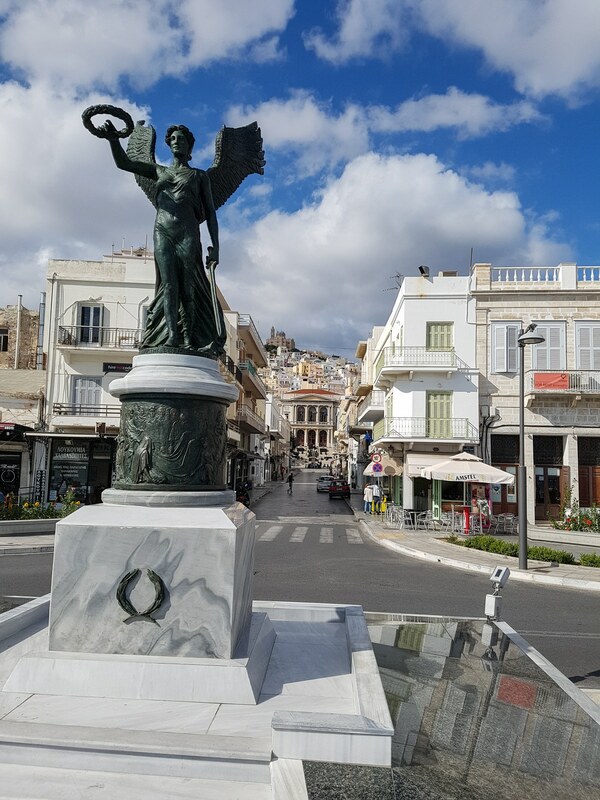 Even though Syros’ first settlements date back to the Phoenicians, Ermoupoli is a relative new city and was created after the Greek revolution started, in 1821. Waves of refugees from Psara, Chios, Hydra and other islands arrived at the island which back then was enjoying neutrality and was considered a safe haven. The locals didn’t have enough space to accommodate all of them within the walls of Ano Syros—the main settlement back then. Consequently tents and huts were raised on the waterfront which eventually turned into small neighborhoods and finally the city of Ermoupoli as it is today. Islanders tend to stick together, so people who fled from Chios built their houses on Dili hill beneath the church of Resurrection and called the district Vrontado like the Chios’ village which today is famous for the “rocket wars” that take place during Easter. Refugees from Psara created Psariana district, and islanders from Hydra the Hydraika. Aristocrats like ship owners and bankers built their mansions on the seafront east of Nisaki which was called Vaporia, meaning “steamers” in Greek. It probably took its name from the windmills that used to be there and resembled the steam ship’s paddle wheels. 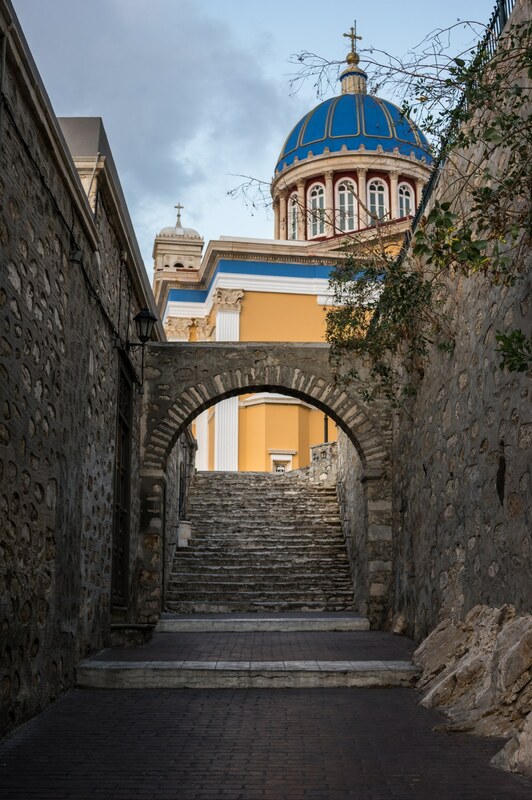 Above the rows of beautiful pastel mansions which are built on the relative steep coastline, stands out the iconic dome of St. Nicholas with its vivid blue color. The most beautiful church of the island I believe. 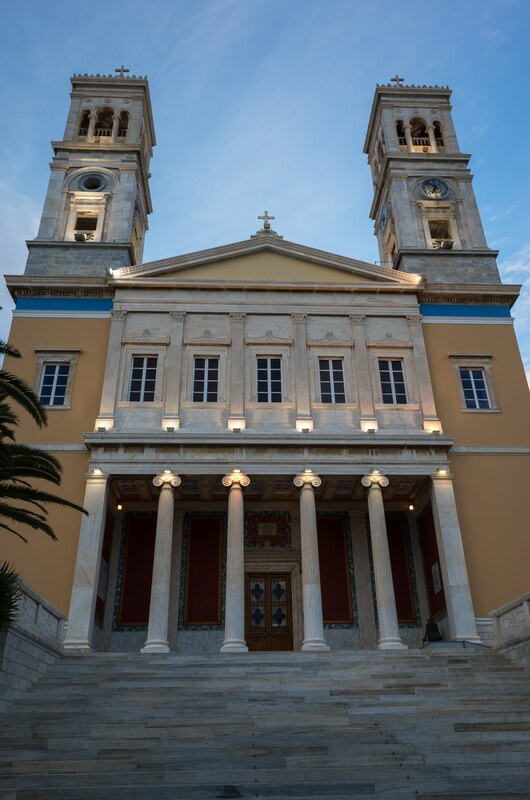 Even though its placement is not as prominent as the churches of Resurrection and St. George, its beautiful neoclassical façade and radiant dome just above the Aegean Sea makes it scenic. Vaporia is my favorite district. The small bay is isolated from the buzz of the main town and its small alleys are wonderful for evening strolls. 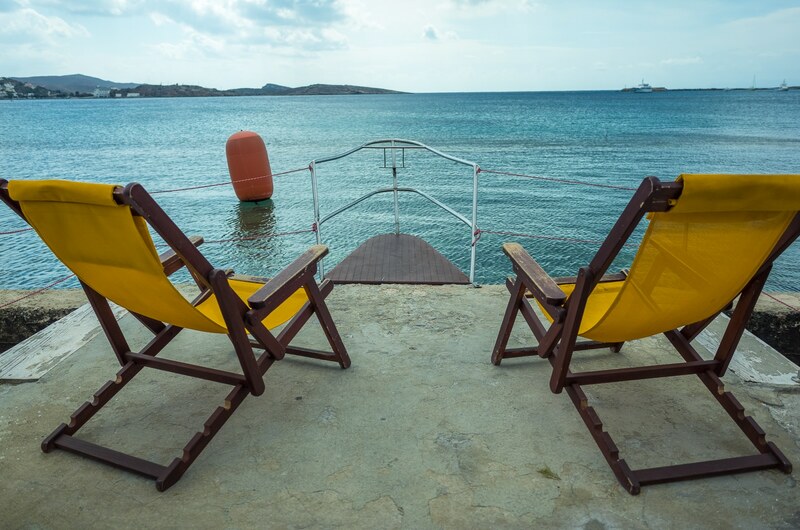 The view from Asteria beach is beautiful and it is no wonder that this is the most photographed side of the whole island. 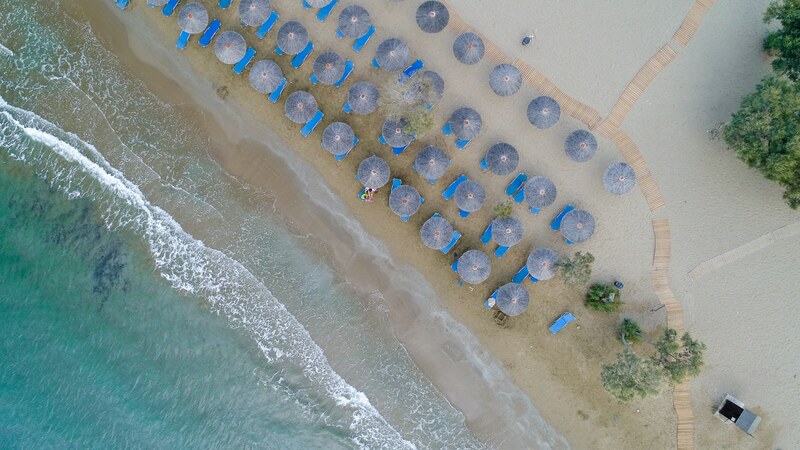 Additionally, it is the only beach in Ermoupoli suitable for swimming and a local’s favorite. A few blocks to the west, the heart of the city beats at Miaouli square. A huge 19th century square—something rare in Greece. Its north side is occupied by the gorgeous City hall, designed by Ernst Ziller—a German architect who designed a great number of public buildings and churches in Greece. It is a meeting point for the locals and the place where kids come to play football, sit at the Hall’s steps or just hang around. 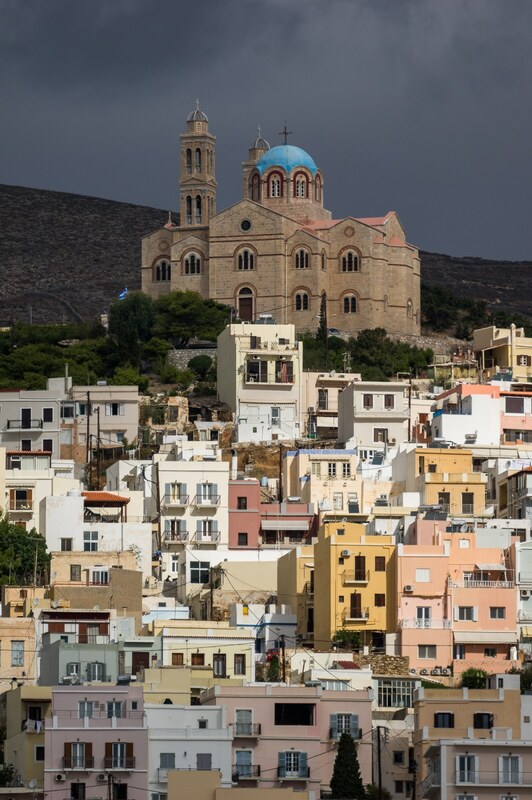 Ano Syros (Upper Syros) was the only settlement that existed by 1821. It was created in the early 13th century after the invasion of Constantinople by the crusaders and the occupation of the island by the Venetians which along with other islands formed the Dutchy of the Aegean. Strategically built above the natural harbor, around the hilltop where St. George stands today. It was a fortified city, built in a radial pattern with the houses very close to each other forming an impenetrable wall. The reason for this was simple—Piracy. Raids were something common back in those days, so people used to live behind walls and away from the sea. The gates were closing for the night and stayed closed until the sun was up again. As I was walking in its maze, a sentiment of isolation filled me. There were people living in those houses but the fact that the streets were empty at that time made it look like it was cut off from the rest of the world. 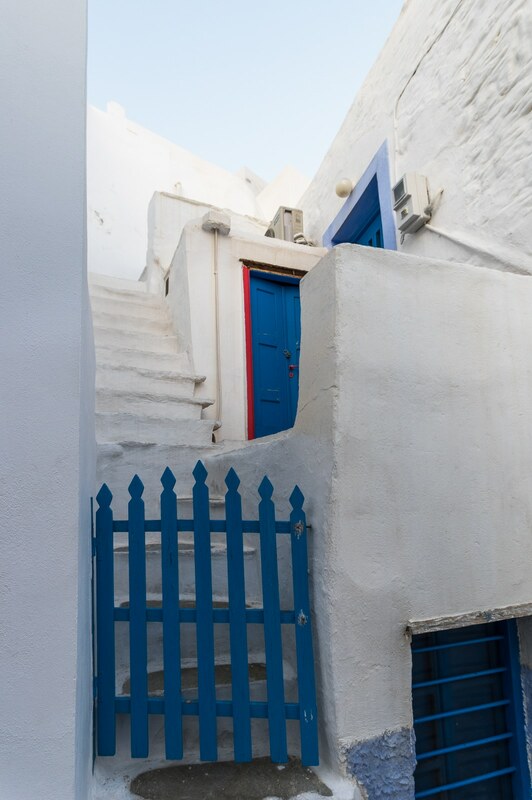 The colored doors and window shutters stand out on the little houses which are built on multiple levels and connect to the street with countless stairs that lead to their entrances and rooftops. The alleys form a labyrinth that goes through these little houses almost never in a straight line but by turning every 10 meters left or right. At some points the maze is interrupted by a small square or a yard which allowed my eyes to wander and “stretch” a bit before they focused again to the front and the next turn of the narrow street. On the highest point of the settlement lies the cathedral of St. George. 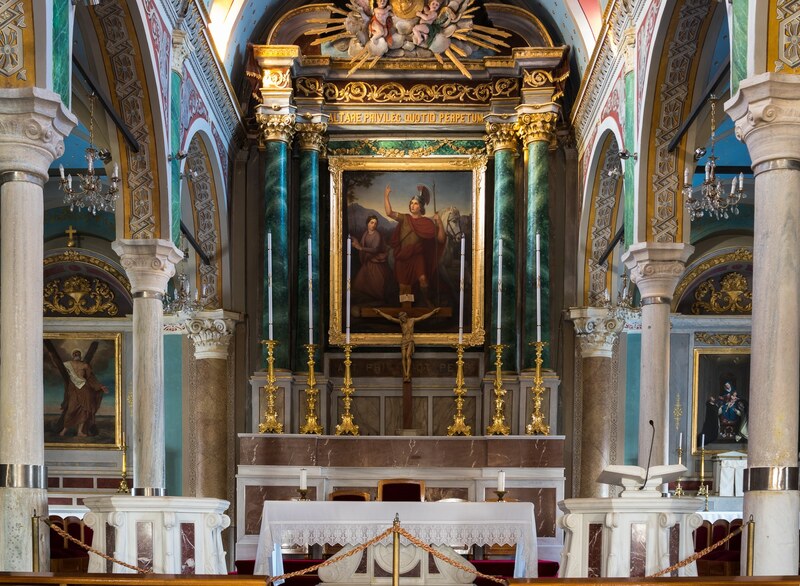 A beautiful church with a three-storey bell tower and an impressive interior covered in marble and featuring some very nice icons on its walls. A great place to watch the sun go down. Another point of interest is Markos Vamvakaris museum. Markos as he is fondly called by all Greeks, was one of Syros’ prominent sons. Born and raised in Ano Syros at the dawn of the 20th century he left for Pireaus at the age of thirteen and after changing several small jobs, he learned how to play the bouzouki and eventually became the “patriarch” of rebetiko—an underground musical genre born in the jails, brothels and hash dens of Greece and Asia Minor. The working class musicians who lived in the margin and played this kind of music were called rebetes or koutsavakides (limp-walkers) from their manneristic way of walking. Being a rebetis didn’t have to do only with music. It was a way of life dictated by a code of honor and unspoken rules. Many of them carried a knife which they didn’t hesitate to draw even if that meant jail time. The whole city of Ermoupoli was visible from the museum’s balcony and as the sun set, the whole city lit up. I loved the restaurants and taverns of the market district east of Miaouli square. 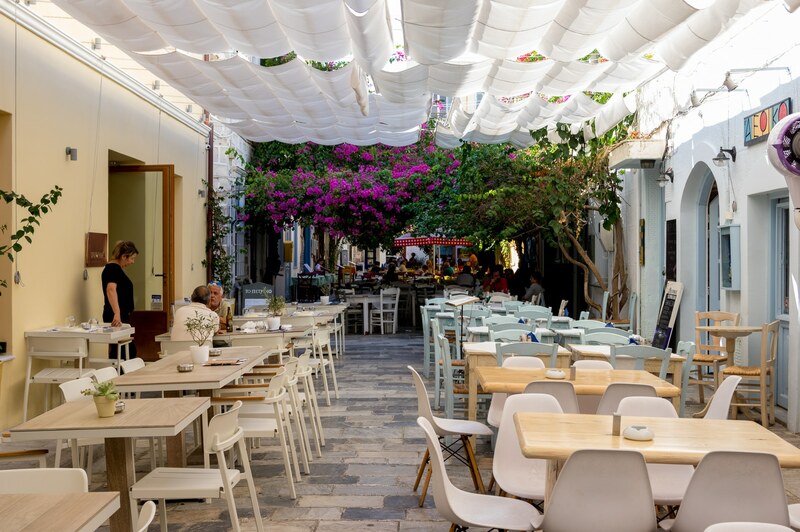 Some of the alleys there were covered with plants which provided shade to the tables underneath and created this familiar Cycladic atmosphere for which this group of islands is famous. For dessert or just to satisfy a sweet tooth, the island has two traditional sweets to offer. Loukoumi, the gel-like sweet made from water, starch, sugar and a flavor like roserwater, mastic or bergamot also known as Turkish delight. And halvadopita, a nougat from honey, sugar, egg white and almonds which is pressed between two wafers. 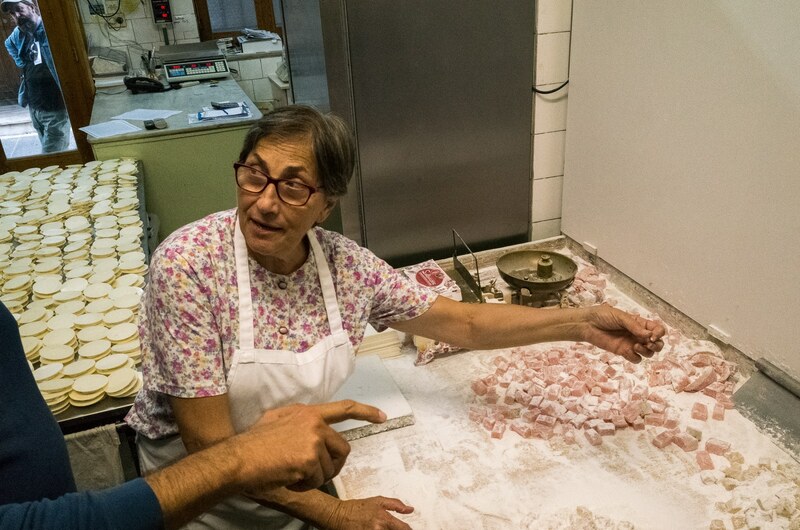 I tried both of the sweets at Sykoutris (Mystra 8) where Mrs Dina continues a long family tradition of sweet making. During night time the narrow streets came to life with people and lights even though it was already end of September. 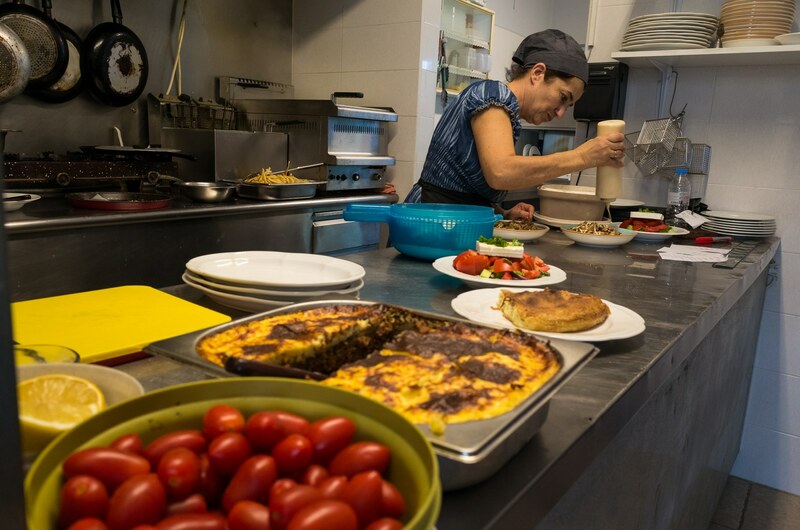 One of the great things about Syros is that the local population is big enough to sustain the island, so most of the places stay open all year round. Of course the heart of the city’s nightlife is the harbor with its bars and cafes which are side by side on the coastal strip. I admit that I had more than one wine nights during my stay. Local wines are excellent and definitely worth a taste. As is the local grape distillate—tsipouro which I prefer over the other classic Greek spirit, Ouzo. 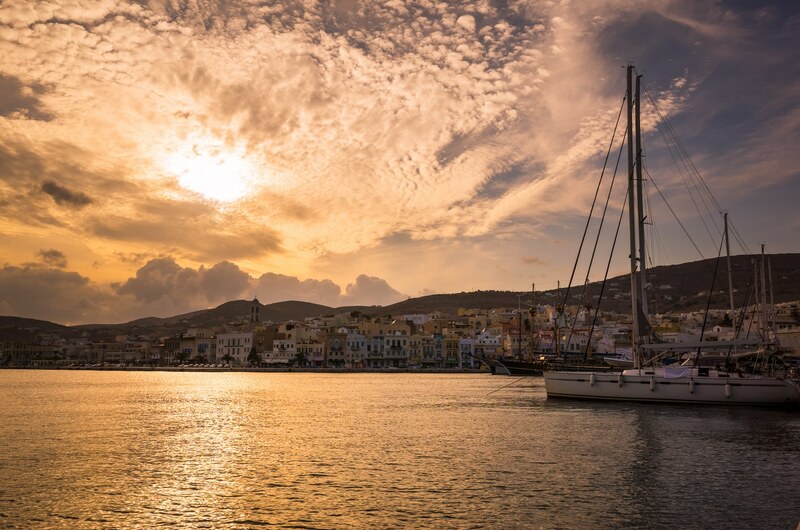 Syros has some magnificent little bays and beaches ideal for relaxation. The beauty of these small resorts is that they are places where locals built their summer cottages rather than a product of touristic overdevelopment. They remain original and that is something that tends to be more and more rare nowadays. Galissas is a cute little village on a narrow and very well protected bay at the west side of Syros. 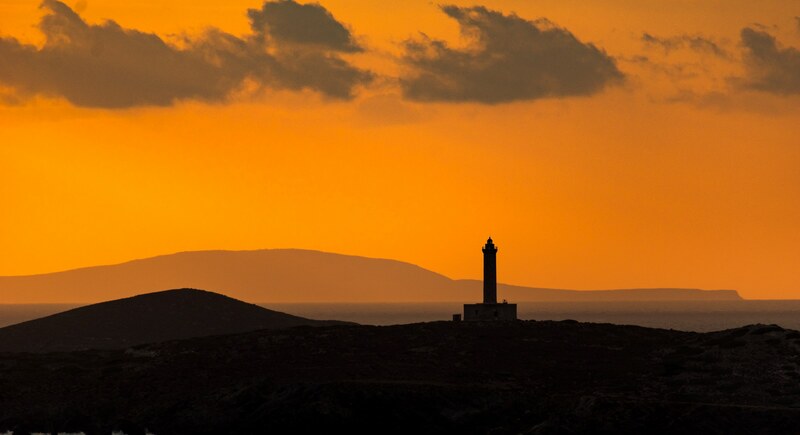 Its trademark is the little white chapel of St. Pakous on top of a hill right on the entrance of the bay. The views to the small coast from up there are astonishing. The beach is small with golden brown sand and the tavern called aVentura was one of the best I tried. Kini is another fishing village, a little bigger than Galissas which has its own little harbor for fishing boats and small yachts. The monument with a mermaid holding a sailor dedicated to seamen that perished in the sea is beautiful. I had the best fish food in the whole island at the magnificent Alou Gialou restaurant which is literally on the sea. Episkopio is not on the coast but it has amazing views to the sea. There is a great viewpoint just outside the church of Profitis Elias at the top of the hill which is ideal for sunrise photography. Dellagrazia (Poseidonia) took its name from Madonna della Grazia—a small church that existed there. It was the favorite resort of the local aristocracy who built their summer retreats there. Many of the extravagant mansions still stand and continue to give an aura of importance to the place. In all Syros left a sweet taste in my mouth. It is a beautiful destination and above all, with reasonable costs. I felt I could spend much more time there. Some places get you a bit “tired” after some time but not this one. 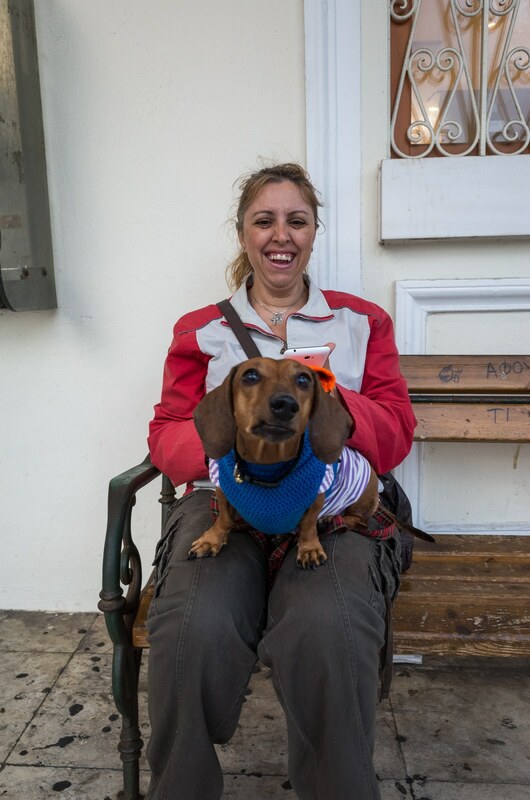 When it was time to board the ship, I was feeling somehow connected to the place and its people. As the ship set course for Pireaus I looked at St. Nicholas one last time, knowing that I would miss it. Thank you! It is a very relaxing island. It has similarities and lots of differences at the same time. You are gonna love loukoumi. Thanks for sharing! So much information and history of Syros. Been wanting to visit for a long time and I hope I will get to visit Greece next year too. Such a gorgeous country. Love your video and the photos are amazing! Thank you! I think Greece is a must to go for all people, no matter what their interests are. I love your detailed post and your photos. I’ve been to Greece but never to this island. After reading it I think I should visit. Thank you Jana, it’s a great all year round destination. What a beautiful unique story! The pictures are so inviting! Wow! 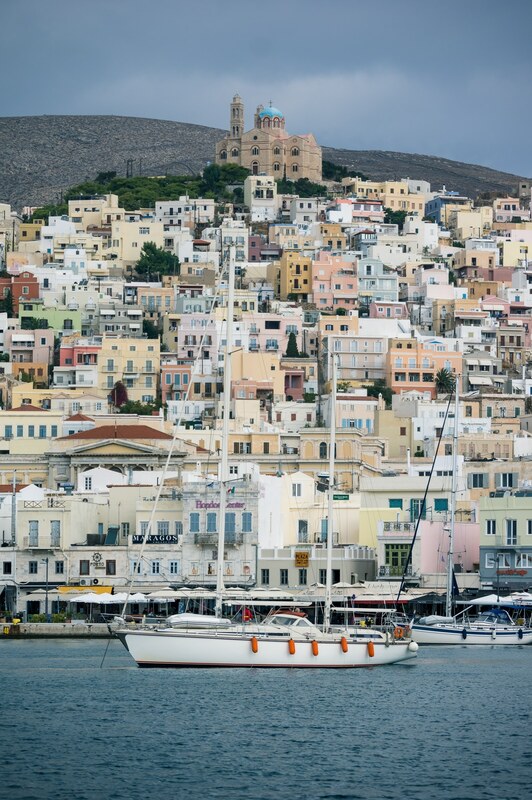 Syros seems so breathtaking and picturesque. 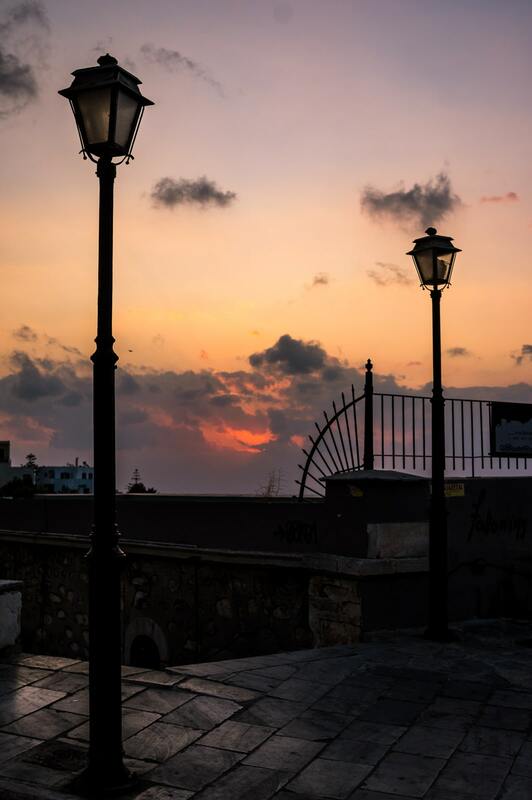 Your pictures left me speechless, Chrisostomos. 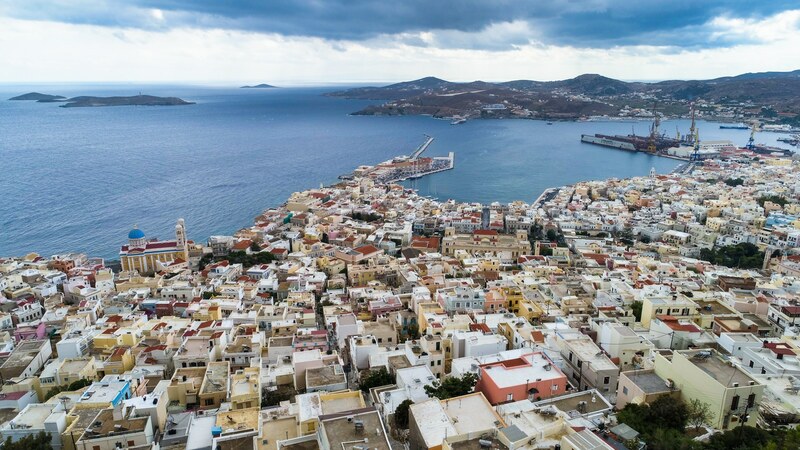 When’s the best time of the year to explore Syros? 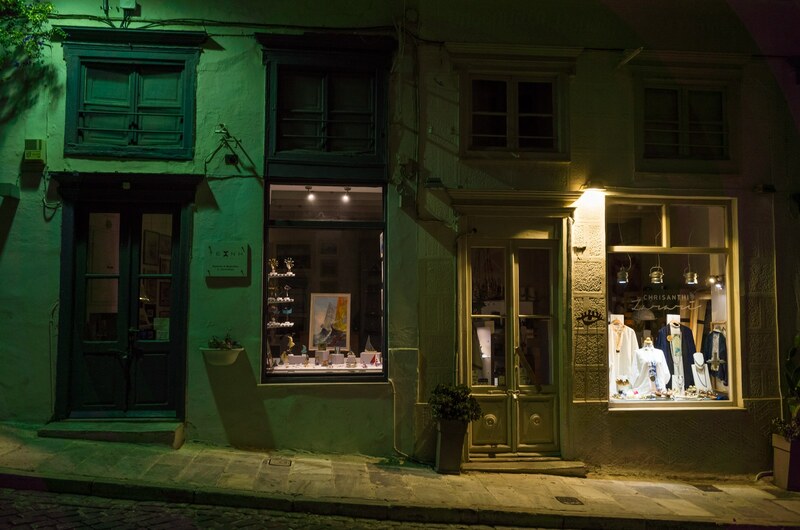 Syros is not a touristic island so almost everything is open all year round. I would probably choose late September or early May. The island won’t be crowded but the weather should be good enough for a swim.